Trade assets using five different types of binary options, namely the Digital Options, Option Builder, One Touch Options, 60 Seconds, and Open Platform. Through these easy-to-use trading types, even novice traders can enjoy the unlimited earning opportunities offered by XoptionsTrading. With X Options Trading review, you can see what thousands of others are trading. This way, you can have an idea on which assets are currently being traded the most, and what online binary options brokers most investors are purchasing. Based on these information, together with other crucial analyses, you can then formulate your own near-accurate speculation. Aside from being in-the-know with the most frequently traded assets, XoptionsTrading also boasts its efficient 24/7 support services. All traders can automatically gain access to this online broker’s highly knowledgeable account executives. You can reach its support team via email, phone, or live chat. This binary trading platform’s Asset Index contains some of the hottest assets being traded. It lists not just the assets’ names but also their trading hours and expiry rate rules. So right before you open a trade, you can already gain an understanding of how to calculate your potential earnings for a specific asset. 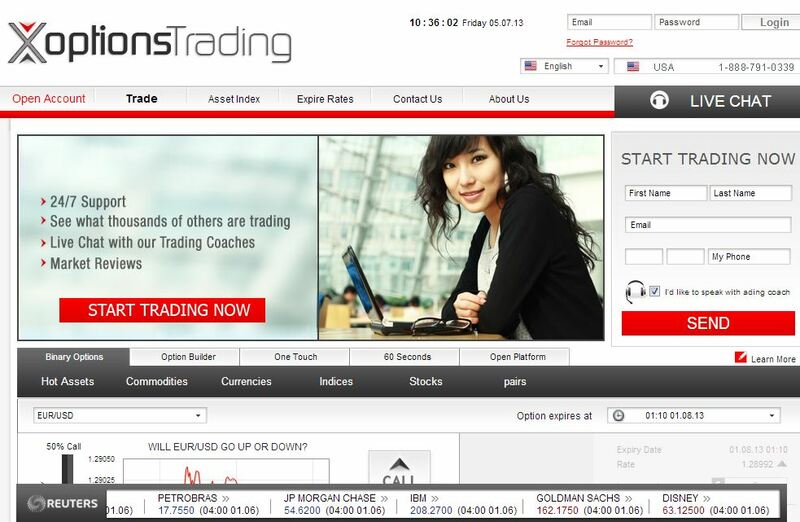 X Options Trading currently offers 6 commodities, 22 indices, 13 currency pairs, and 16 international stocks. You can trade some of popular assets such as the EUR/GBP, GBP/USD, Oil, Gold, FTSE 100, NASDAQ Future, and stocks from Apple among others. As a web-based platform, X Options Trading allows its investors to trade on-the-go using its mobile platform version. Now, you can monitor your open trades, modify or close them, and even start new ones. With attractive payoffs ranging from 68-75%, trades ending in-the-money can definitely bring profits to any trader. Moreover, your trades that close out-of-the-money can also entitle you to a refund of 5-10% of your original investment.